Mick and Rick have a current song list of 120 songs. What goes into putting these songs together for a live performance takes a lot more work then you might think. Each time Mick and Rick perform their Rock and Soul show live, you will see only the two of them on stage. However, you may be listening to up to 20 different instruments or voices in one song. How is this done? You are about to find out. First of all it starts with recording all the instruments for a song. In most cases when we decide on a song we want to learn, like one of our most current songs, "The Tears Of A Clown", by Smokey Robinson, it starts with drums. Getting the drum track down can be quite a task. But neither Mick or Rick is an actual drummer. So Rick, uses digital sampled drum tracks to create the drums for each song, sometimes using up to four separate tracks just for the drums. Rick's Yamaha keyboard is the catalyst for many of the instruments you will hear in a song, including the piano, organ, horns, flutes, cellos, violins, strings, bass and the drums. The laptop computer has a sophisticated recording studio software program called MIXCRAFT 6 installed on it and this is where the song tracks for each instrument are created along with all the vocal tracks. Each instrument is recorded on a separate track. This allows me to mix all the tracks together and adjust the sound to have a finished song sound live. This is not the normal technique used to when recording a song for CDs or downloads. 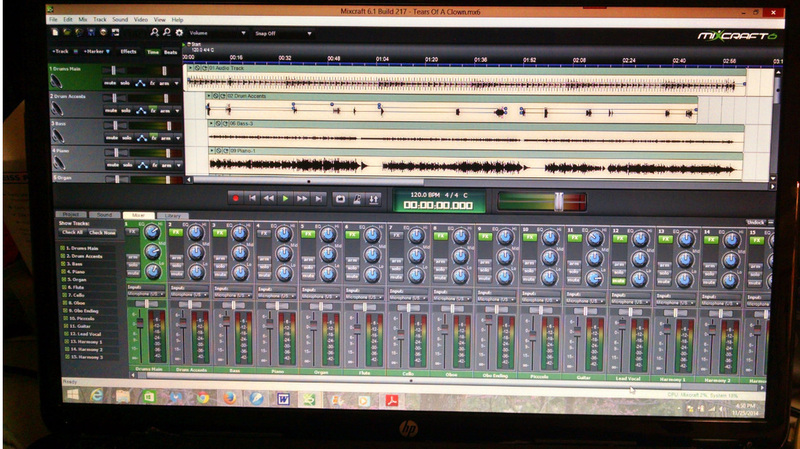 Take a look at this photo of some of the tracks on Mixcraft. If you look at the controls on the bottom of the photo above, you will see that each track has it's own separate mixing controls. This particular song, "The Tears Of A Clown", has 15 tracks with two separate drum tracks. It also has Bass, Piano, Organ, Guitar, Flute, Cello, 2 Oboe tracks, Piccolo, lead vocal and 3 vocal harmony tracks. Here are a couple of close ups of Mixcraft, which by now you should be able to tell, is basically a recording studio on a computer. So when the song is completed about 4 hours of time has gone into it and then we have to add Mick's lead vocal. By the time it is ready for our live performance we can have about 5 hours total time in completing the song. When we play this song live, the recorded lead vocal and one harmony vocal is left out of the track, and on this particular song, "The Tears Of A Clown", Mick and I sing those two parts live. One more thing, although we use the digital samples sounds that my keyboard produces for most of the instruments, actual guitars and bass are used for those tracks. Now, listen to clip of the song without the live instruments but without vocals. These are the pre-recorded sounds you will hear along with the pre-recorded and live vocals when we perform.